Shifting from Hackney to Hastings and all places in-between, while dissecting a man's fractured psyche piece by piece, this book is a puzzle and a quest - for both writer and reader. It is a sharp, edgy mystery of London and its environs. 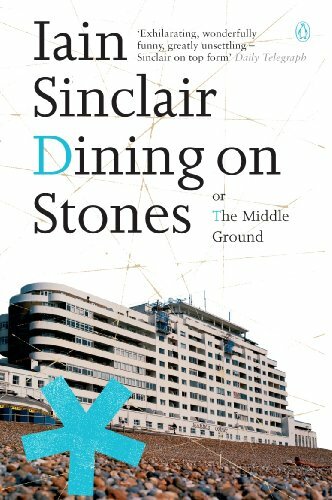 Dining on Stones is Iain Sinclair's sharp, edgy mystery of London and its environs Andrew Norton, poet, visionary and hack, is handed a mysterious package that sees him quit London and head out along the A13 on an as yet undefined quest. Holing up in a roadside hotel, unable to make sense of his search, he is haunted by ghosts: of the dead and the not-so dead; demanding wives and ex-wives; East End gangsters; even competing versions of himself. Shifting from Hackney to Hastings and all places in-between, while dissecting a man's fractured psyche piece by piece, Dining on Stones is a puzzle and a quest - for both writer and reader. 'Exhilarating, wonderfully funny, greatly unsettling - Sinclair on top form' Daily Telegraph 'Prose of almost incantatory power, cut with Chandleresque pithiness' Sunday Times 'Spectacular: the work of a man with the power to see things as they are, and magnify that vision with a clarity that is at once hallucinatory and forensic' Independent on Sunday Iain Sinclair is the author of Downriver (winner of the James Tait Black Memorial Prize and the Encore Award); Landor's Tower; White Chappell, Scarlet Tracings; Lights Out for the Territory; Lud Heat; Rodinsky's Room (with Rachel Lichtenstein); Radon Daughters; London Orbital, Dining on Stones, Hackney, that Rose-Red Empire and Ghost Milk. He is also the editor of London: City of Disappearances.